We offer transportation in our 14-passenger van to several locations, including Whitewater Amphitheater, The costs range from $7-$20, depending on the number of people in your party and destination. The Texas Hill Country is the second largest wine-producing region in the country and our dry, sunny climate produces a product that often draws comparisons with Portuguese wines. 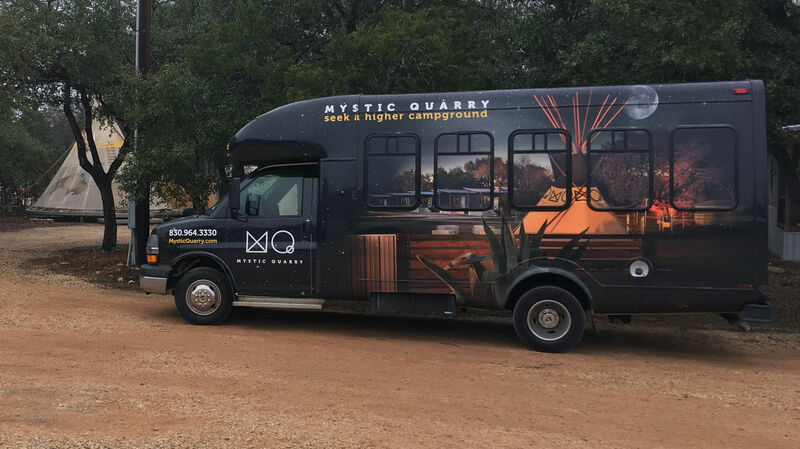 Winery tours are a popular way to check two boxes off your bucket list at the same time, for you can take a scenic drive through the Texas Hill Country while sampling our savory Texas wines in the same trip. With our beautiful lakes and rivers comes lakeside dining, where you can savor the views along with the food. There are a plethora of great restaurants and bars right here in Canyon Lake. Or you can take a quick jaunt to Gruene, New Braunfels or Wimberley for even more options. Please call the front desk for dinner recommendations and directions. Located one mile from Mystic Quarry, Whitewater Ampitheatre’s Creekside Stage hosts some of the music industry’s most popular artists who perform just steps from the Guadalupe River. It’s an outdoor concert experience with state-of-the art sound and an adjacent Biergarten with waterfront seating. We offer shuttle service to and from the concert venue. For ticket information, visit Whitewaterrocks.com. From the outlet malls in nearby San Marcos to the local antique stores and Farmer’s Markets to the festive Market Days of Gruene and Wimberley, there are plenty of reasons not to forget your wallet when you go exploring the area. Call the front desk for shopping recommendations or directions to our local businesses. Similar to nearby Austin, the Canyon Lake area is crazy for festivals. Cities such as Boerne, Driftwood, New Braunfels, San Marcos and Wimberley host weekend long events such as Jazz Fest, Crawfish Fest, Old Settler’s Music Fest, Craft Beer Fest, Kidsfest, Folkfest, Eggfest, Quiltfest, Saengerfest, Troutfest, Lavenderfest, Butterflyfest and Wurstfest, among many others. See our events page for more info. Driving through the Texas Hill Country, it’s pretty clear that we’re a horse-loving, horse-riding community. As you can imagine, there’s no shortage of ranches or stables where you can hop on a horse and be guided down one of the areas most gorgeous nature paths. Please call the front desk for horseback riding recommendations or reservations. The Guadalupe River, a short mile from our campground, is famous for calm, clear water that’s become increasingly popular for water sports such as tubing and kayaking. While there are many tube and boat rental facilities in the area, Whitewater Sports and River Sports Tubes offer discounts to Mystic Quarry guests for transportation to and from their facility. Please call the front desk for more information or to schedule a trip. The Canyon Lake area is a discovery zone for kids and those still a child at heart. In fact, Mystic Quarry got its name for the natural mysteries found in the earth nearby. Some of the local attractions to keep the kids entertained include The Heritage Museum, featuring over 350 dinosaur tracks and The Canyon Lake Gorge, which offers tours through the base of the Canyon for viewing more dinosaur tracks, waterfalls and natural pools. In neighboring San Marcos, Wonder World Park features the only earthquake-formed cave in America and in Boerne, Cave Without A Name features newer formations of stalagmites, salactites, cave drapery and flowstones. For thrill seekers, consider a trip to Wimberley for Zipline Adventures or New Braunfels for a day at Schlitterbahn Waterpark. Please call the front desk for more information or directions. Our local museums lean toward the fantastical and eclectic. Just down the road, you can check out the Heritage Museum to see over 350 dinosaur tracks, Native American history and more. Wimberley’s Jack Glover Cowboy Museum features artifacts and memorabilia from the Wild Wild West, and New Braunfels’ McKenna Children’s Museum is a romper room of playscapes including a ranch, campground, art studio and aquarium. For more traditional aficionados, the McNay Art Museum in New Braunfels has curated more than 20,000 works of art from Medieval to Modern. The Texas Hill Country got its name for its hills and valleys, making Canyon Lake a paradise of hike and bike trails. One of the more popular trails is the Madrone Trail, an 8-mile loop that peaks at 508 feet, offering beautiful views. Trail maps will guide you through a 2.5, 4.5 or 6.5 mile run. More moderate hikers prefer the Guadalupe Park Trail, a mere 1.8 mile in and out excursion. Call the front desk for more information, directions or maps. One mile from Mystic Quarry you’ll find the Guadalupe River, the southernmost trout fishery in the United States, flowing with calm, cool water that draws fly fishermen to the area year round. One of the most popular fishing holes is Devil’s Playground, just one of many starting points for catching brown and rainbow trout, as well as small, large and Guadalupe bass.